A topic many of my coaching clients ask me about is how to know if your prospecting process is working. The shortcut answer to the question is that I ask them what their sales are compared to the prospecting they do. Sounds simple, but the answer is far more complex and not easily answered despite what some might say. To measure your prospecting, you first have to be candid with what you’re currently doing. Too many salespeople when pushed will finally admit they really don’t have a process. To make matters worse, not only do they not have a process, but they can’t even clearly define what they’ve done over the previous three months with regard to prospecting. The next biggest problem in measuring prospecting effectiveness is having a process you’ve stuck with over a long enough period of time to be statistically viable. Are you the type of person who tries a new technique for a few days and gives up on it if the response is not there? If you do this, you might very well be throwing out a fantastic idea you just didn’t give enough time. Conversely, are you the person who has success the first time doing something and then rushes to think you’ve now found the perfect strategy? Developing a prospecting process takes time, and as much as some would like you to believe, there is no “easy button” you can push to make it all happen. Do you know who your ideal customer is and what % of your leads represent this profile? Can you articulate the top five outcomes you help customers with and the approach you use when you’re prospecting? What is the length of time it takes to move a person from a lead to a customer? What are the key milestones you see these people cross during this period of time? What is your process for qualifying a lead and how much time and resources does it take? 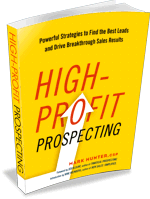 Is your prospecting process focused on educating or converting? How do you know? What is the methodology used to develop leads and what have you changed with it in the past year? What is the role marketing plays in prospecting and what is the end result of new sales that can be attributed to marketing? Where does social media come into play and what are the results you’re achieving and, more importantly, how does it impact your closing ratio? What is the return on investment of your time for each hour spent on prospecting? How does this number compare to last year? I’ve only begun to share a few of things you need to be looking at far more closely than I suspect you have. I’m going to say you’ve probably read this list and are now even more concerned. Sales is not a destination. It’s a journey that has a long path. Our goal is to ensure we’re on the right path and have the right equipment. The key is to be continually upgrading your performance, assessing what you’ve been doing and being rationale in how you make your decisions. I’ve found many times the best solution lies not in the speed of its implementation ,but in its clarity of thought and execution. If you are ready to do a deep dive into your sales and marketing process and you’re a small business owner or a solo-preneur, I suggest you check out a 4-week intensive live on-line program I’m doing with David Newman, author of “Do It! Marketing.” You can find out more at this link. PrevPreviousAre You Guilty of Making These Prospecting Mistakes? These are all phenomenal questions. Having trouble answering the first and last question. New company, haven’t really been developing clients until 4-5 months ago. Defining the prospects that represent our ideal customer is in development, I am creating buyer personas as we go. However, our clients are so new that each client is different from the other so we have buyer personas for each. Each one is a different size of client, has different needs, chose us for a different reason. However, as we get more sales we will be able to categorize more.